For other people named James Somerville, see James Somerville (disambiguation). Admiral of the Fleet Sir James Fownes Somerville, GCB, GBE, DSO, DL (17 July 1882 – 19 March 1949) was a Royal Navy officer. He served in the First World War as fleet wireless officer for the Mediterranean Fleet where he was involved in providing naval support for the Gallipoli Campaign. He also served in the Second World War as commander of the newly formed Force H: after the French armistice with Germany, Winston Churchill gave Somerville and Force H the task of neutralizing the main element of the French battle fleet, then at Mers El Kébir in Algeria. After he had destroyed the French Battle fleet, Somerville played an important role in the pursuit and sinking of the German battleship Bismarck. Somerville later became Commander-in-Chief, Eastern Fleet. In April 1942 Admiral Chūichi Nagumo's powerful Indian Ocean raid inflicted heavy losses on his fleet. However, in spring 1944, with reinforcements, Somerville was able to go on the offensive in a series of aggressive air strikes in the Japanese-occupied Dutch East Indies. He spent the remainder of the War in charge of the British naval delegation in Washington, D.C.
Somerville was born on 17 July 1882, the second son of Arthur Fownes Somerville, of Dinder House, Somerset, and his wife Ellen Somerville (née Sharland, daughter of William Stanley Sharland of New Norfolk, Tasmania). His father had studied at Trinity Hall, Cambridge, was called to the bar as a barrister in 1875 and had then become a Recorder of Wells, Somerset in 1916 and had served as President of the Somerset Archaeological Society. Somerville was descended in the male-line from the Fownes family of Nethway and Kittery Court, his ancestors being John Fownes the younger and John Fownes the elder were Members of Parliament for Dartmouth in the early eighteenth century and another ancestor went on to marry an heiress of the Somerville family of Dinder House, changing their surname to Somerville in 1831 in honour of this connection. Through his paternal grandmother, he was descended from the Hood family, which had a long tradition of naval service and which counted as members Vice Admiral Sir Samuel Hood, 1st Baronet, and Admiral Samuel Hood, 1st Viscount Hood. In 1913, Somerville married Mary Main; they had a daughter and a son. The news reader Julia Somerville is one of their granddaughters. Somerville joined the training ship HMS Britannia as a cadet on 15 January 1897 and served as midshipman in the cruiser HMS Royal Arthur in the Channel Fleet and then in the cruiser HMS Warspite on the Pacific Station. He was promoted to sub-lieutenant on 15 December 1901 and to lieutenant on 15 March 1904 before joining the armoured cruiser HMS Sutlej on the China Station. He attended the torpedo school HMS Vernon in 1907 and then remained there to work on the development of wireless telegraphy. Somerville served in the Royal Navy in the First World War, initially as a wireless officer in the battleship HMS Marlborough in the Grand Fleet and then as fleet wireless officer for the Mediterranean Fleet serving in the battleship HMS Queen Elizabeth, then the battlecruiser HMS Inflexible and then the cruiser HMS Chatham. In HMS Chatham he was involved in providing naval support for the Gallipoli Campaign. He was promoted to commander on 31 December 1915, and awarded the Distinguished Service Order and Mentioned in Despatches on 14 March 1916. He transferred to the battleship HMS King George V in the Grand Fleet in January 1917 and then joined the signals school at Portsmouth at the end of the year. Somerville stayed in the service after the war becoming Executive Officer in the battleship HMS Ajax in the Mediterranean Fleet in March 1920 and then Executive Officer in the battleship HMS Emperor of India also in the Mediterranean Fleet. Promoted to captain on 31 December 1921, he joined the Admiralty as Deputy Director of Signals in early 1922, before becoming Flag Captain to Sir John Kelly, commanding the 4th Battle Squadron, in the battleship HMS Benbow in August 1922. He returned to the Admiralty as Director of Signals in February 1925 before becoming Flag Captain to Sir John Kelly in his new role as Commander of the 1st Battle Squadron in early 1927, first in the battleship HMS Warspite and then, after the Warspite struck a rock, in the battleship HMS Barham. He joined the directing staff at the Imperial Defence College in 1929 and became commanding officer of the cruiser HMS Norfolk in the Home Fleet in December 1931. Promoted to commodore on 14 October 1932, he became commander of the Royal Navy Barracks at Portsmouth later that month and then, after promotion to rear admiral on 12 October 1933, he became Director of Personnel Services at the Admiralty in May 1934. As Director of Personnel Services he introduced a seaman's welfare scheme following the Invergordon Mutiny. He was appointed a Companion of the Order of the Bath on 1 January 1935. Somerville became Flag Officer Destroyers in the Mediterranean Fleet in March 1936 and during the Spanish Civil War helped protect Majorca from the Republicans. Promoted to vice admiral on 11 September 1937, he became Commander-in-Chief, East Indies with his flag in the cruiser HMS Norfolk in July 1938. He retired with suspected tuberculosis in early 1939 but was still advanced to Knight Commander of the Order of the Bath on 8 June 1939. You are charged with one of the most disagreeable tasks that a British Admiral has ever been faced with, but we have complete confidence in you and rely on you to carry it out relentlessly. Although privately Somerville felt that such an attack would be a mistake, he carried out his orders. The French refused to comply with British conditions, so on 3 July 1940, Force H attacked French ships at Mers-el-Kébir. Somerville's forces inflicted severe damage on their erstwhile allies, most notably sinking the battleship Bretagne with heavy loss of life. Several other major French ships were damaged during the bombardment. The operation was judged a success, although he admitted privately to his wife that he had not been quite as aggressive in the destruction as he could have been. He was Mentioned in Despatches on 16 August 1940. Somerville transferred his flag to the battlecruiser HMS Renown in August 1940 and led the British forces in the Battle of Cape Spartivento in November; Churchill was outraged at Somerville for not continuing the pursuit of the Italian Navy after that battle and dispatched Earl of Cork and Orrery to conduct an inquiry, but Cork found that Somerville had acted entirely appropriately. 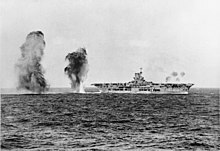 Force H bombarded Genoa on 9 February 1941, and, after Somerville had transferred his flag to the aircraft carrier HMS Ark Royal in May 1941, also played an important role in the pursuit and sinking of the German battleship Bismarck later that month. Somerville transferred his flag to the battleship HMS Nelson in August 1941 and also played a major role in protecting Malta from enemy attack in autumn 1941. He transferred his flag to the battleship HMS Rodney and then to the battleship HMS Malaya. He was appointed a Knight Commander of the Order of the British Empire for his service with Force H on 21 October 1941. 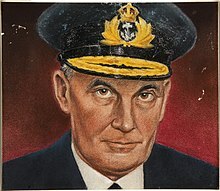 Somerville became Commander-in-Chief, Eastern Fleet with his flag in the battleship HMS Warspite in March 1942 and was promoted to full admiral on 6 April 1942. Following the fall of Singapore, Somerville transferred his fleet headquarters from Trincomalee in Ceylon to Kilindini in Kenya. In April 1942 Admiral Chūichi Nagumo's powerful Indian Ocean raid inflicted heavy losses on Somerville's fleet including an aircraft carrier, two cruisers, two destroyers, one corvette, five other vessels, and 45 aircraft – all destroyed by the Imperial Japanese Navy. However, in Spring 1944, with reinforcements, Somerville was able to go on the offensive in a series of aggressive air strikes in the Japanese-occupied Dutch East Indies: these included attacks on Sabang in April and May 1944 and on Surabaya in May 1944. He was also advanced to Knight Grand Cross of the Order of the Bath on 22 August 1944. 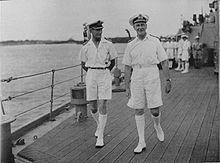 Somerville was placed in charge of the British naval delegation in Washington, D.C. in October 1944 where he managed—to the surprise of almost everyone—to get on very well with the notoriously abrasive and anti-British Admiral Ernest King, the United States' Chief of Naval Operations. He became Deputy Lieutenant of Somerset on 8 November 1944, was promoted to Admiral of the Fleet on 8 May 1945 and was advanced to Knight Grand Cross of the Order of the British Empire on 1 January 1946. He was also appointed a Knight Grand Cross of the Order of Orange-Nassau by the Netherlands government and a Commander of the Legion of Merit by the United States. In retirement Somerville became Lord Lieutenant of Somerset in August 1946 and was appointed a Knight of the Venerable Order of the Hospital of St John of Jerusalem on 23 December 1946. He lived at the family seat of Dinder House in Somerset where he died of coronary thrombosis on 19 March 1949. His body was buried in the churchyard of St Michael and All Angels Church at Dinder. ^ Fox-Davies (1905), p. 1203 ; Venn (1953), p. 159 for her father's full name. ^ According to Venn (1953), p. 591, Arthur Fownes Somerville was the son of James Curtis né Fownes (later Somerville); born in 1807, he was the son of James Somerville né Fownes (later Somerville), JP (see Venn (1944)); Burke (1847), p. 1262, then states that this James Somerville Somerville was the son of the Rev. Thomas Fownes, son of John Fownes, MP for Dartmouth from 1715 to 1722, who was son of John Fownes, MP for the same from 1714 to 1715. Burke, ibid., also states that the Rev. Thomas married a daughter and heiress of the Hon. George Somerville of Dinder House, and describes the inheritance of that estate as well as the name change. ^ Simpson (2004) ; Venn (1953), p. 159 gives his mother as Emily Piriam Hood, daughter of Sir Alexander Hood, Baronet. He was the second Baronet and his family is outlined in Burke (1865), pp. 583–584, which also refers to the connection with the Viscounts Hood. ^ "No. 27549". The London Gazette. 5 May 1903. p. 2841. ^ "No. 27659". The London Gazette (Supplement). 18 March 1904. p. 1791. ^ "No. 29423". The London Gazette (Supplement). 31 December 1915. p. 90. ^ "No. 29507". The London Gazette (Supplement). 14 March 1916. p. 2872. ^ "No. 34119". The London Gazette (Supplement). 28 December 1934. p. 3. ^ a b "Admiral Sir James Somerville, 1882–1949". History of War. Retrieved 31 August 2014. ^ "No. 34633". The London Gazette (Supplement). 6 June 1939. p. 3853. ^ "Mers-el-Kebir: A Battle Between Friends". Military History Online. Retrieved 31 August 2014. ^ "No. 34925". The London Gazette. 16 August 1940. p. 5068. ^ a b c "Sir James Somerville". Oxford Dictionary of National Biography. Retrieved 31 August 2014. ^ "No. 35317". The London Gazette (Supplement). 17 October 1941. p. 6099. ^ "No. 36734". The London Gazette. 6 October 1944. p. 4592. ^ "Leonard Birchall and the Japanese raid on Colombo". National Defence and the Canadian Armed Forces. Archived from the original on 10 August 2014. Retrieved 31 August 2014. ^ "No. 36666". The London Gazette (Supplement). 18 August 1944. p. 3887. ^ "No. 36800". The London Gazette. 17 November 1944. p. 5293. ^ "No. 37407". The London Gazette. 28 December 1945. p. 13. ^ "Sir James Somerville". Unit Histories. Retrieved 31 August 2014. ^ "No. 37842". The London Gazette. 3 January 1947. p. 122. Fox-Davies, Arthur Charles (1905). Armorial Families. London: Hurst & Blackett. Holland, James (2011). The Battle of Britain. Corgi. ISBN 978-0552156103. Morris, Oswald (2006). Huston, We Have a Problem: A Kaleidoscope of Filmmaking Memories. Rowman & Littlefield Education. ISBN 978-0810857063. Venn, J.A. (1944). Alumni Cantabrigienses, part ii, volume ii. University of Cambridge. Venn, J.A. (1953). Alumni Cantabrigienses, part ii, volume v. University of Cambridge. Burke, B (1865). A Genealogical and Heraldic Dictionary of the Peerage and Baronetage of the British Empire. Harrison. Burke; Burke, J.B (1847). A Genealogical and Heraldic Dictionary of the Landed Gentry of Great Britain and Ireland volume ii. Henry Colburn. MacIntyre, Donald (1961). Fighting Admiral: The Life of Admiral of the Fleet Sir James Somerville. Evans Brothers, London. Somerville, James (1996). The Somerville Papers: Selections from the Private and Official Correspondence of Admiral of the Fleet Sir James Somerville, GCB, GBE, DSO. Navy Records Society, London. ISBN 978-1859282076. Wikimedia Commons has media related to Sir James Somerville. A biography of Admiral Somerville (H.M.S. Hood Association web site). Transcription of Force H War Diary.